The Mountains of Instead: Fangy fun (Review: My Love Lies Bleeding/Hearts at Stake by A. Harvey). 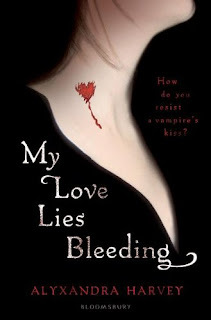 Fangy fun (Review: My Love Lies Bleeding/Hearts at Stake by A. Harvey). 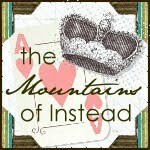 I'd read some mixed reviews of this book and so did not have any thoughts on what to expect. I was delighted when I totally loved it and gobbled the whole thing up in an afternoon. Yum yum yum. When it first arrived through my letterbox I was pretty disappointed by how slight it looked (coming in at about 250 pages, it's quite short) but it packs an amazing punch for all that. The author has a veritable slew of information flying off the page from the start, without ever leaving you feeling overwhelmed. Be it about the complicated tribal system and mythology of the vamps of the story or the names of Solange's 65 million brothers (well, seven, but they seem like a lot) I always felt that I was able to keep up and understand what was going on. Alyxandra employs a duel narrative system, skipping back and forth from Solange to Lucy which works very well (although I found this a little disconcerting at first – maybe because I'm more used to a male/female duel narrative and kept getting my “she's” confused when they talked about each other). The Drake brothers are painted as totally, totally delicious with Nicholas being the stand-out (he is definitely the male “lead” and smoulders and gazes appropriately – more yum). I do think that the tag line on the front of the UK cover of the book is slightly misleading. It asks “what would you risk for a Vampire's kiss?” which kind of made me think that this would be a classic Vampire/mortal angsty relationship drama (Bella and Edward/Angel and Buffy etc etc) and it really is NOT. 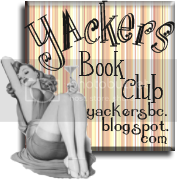 While the budding relationship between Lucy and Nicholas is covered nicely (with both humour, romance and even a wee bit of sexiness) there is no angst involved at all. Lucy doesn't seem to be all that bothered about kissing a vampire (well, not in a bad way anyway) and Nicholas it not at all tortured (yay!). The main story line is definitely more of an action adventure and it's actually the tentative friendship between Solange and Helios-Ra vampire hunter Keiran that has me looking forward to future books in the series (book two, Blood Feuds, is out July 2010). All in all, I thought it was great. Yes, it perhaps could have done with more padding – it's pretty lean and there isn't much flim flam (sometimes a bit of flim flam actually doesn't go amiss, especially when you enjoy a book so much you would have liked at least oh, 600 more pages), yes, Solange is a funny name and yes, they all seem to wear cargo pants all the time, but it's a great story, set in a well thought out world and sets the rest of the series up nicely. Incidentally, I believe that this title was published as Hearts at Stake in the US. I have to say that I would most certainly never have even picked it up had it been published under that in the UK – the gorgeous title is what made me consider it in the first place. Great review--I plan to check it out for myself.